The erstwhile Shri Raghunath Sanskrit Mahavidyalaya established by the former Ruler of the Jammu & Kashmir was taken over as one of the constituent Vidyapeetha by the Sansthan on Ist April, 1971 and was named as Shri Ranbir Kendriya Sanskrit Vidyapeetha. On declaration of the Sansthan as Deemed to be University, the Vidyapeetha was renamed as Shri Ranbir Campus. 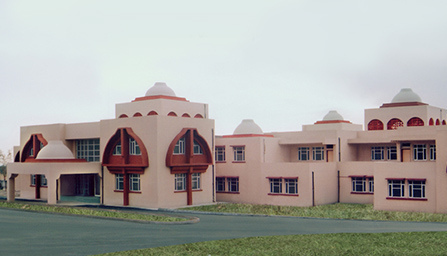 It functions with eight Departments of Veda, Vyakarana, Jyotisha (Phalita & Siddhanta), Darshana, Sahitya, Shiksha Shastra, Kashmir Shaiva Darshana and Mukta Svadhyaya Kendra (Centre for Distance Education). Shastraic education is imparted by well versed teachers studied Shastras in traditional and modern lines of different disciplines to the Students of Prak Shastri (Higher Secondary) to Acharya (M.A.) level. Shiksha Shastri (B.Ed.) Course was started in 1979 for the training of Sanskrit teachers. Shiksha Acharya (M.Ed) course is also offered in this Campus. Languages Hindi, Dogri, and English are taught and subjects like Political Science, History, Physical Education, Computer Science, and Environmental Science are also taught along with traditional subjects up to Shastri (B.A.) level. There is also a good arrangement for Yoga training for the students. Besides, the campus also offers research programme leading to the award of Vidyavaridhi (Ph.D.) Degree in all the traditional and inter-disciplinary subjects. The campus has undertaken an important project of Kashmir Shaiva Darshana Kosha with the objective of compiling a Dictionary of Kashmir Shaiva Darshana under which two volumes have been published. The Campus has a rich library in a built up area of 8472 Sq.meters and 25 published works to its credit. This library has a vast collection of 39063 books out of which 23269 general books and 12552 text books are available besides e-granthalaya and research journals. The land mark event in recent years is inauguration of Campus' own main building, library and residential block at Kot-Bhalwal, Jammu by Hon'ble Dr. Karan Singh Ji, a renowned scholar and Member of Parliament on 18th March, 2007. The Govt. of Jammu and Kashmir had allotted a piece of land measuring 83.6 (10.45 acres) canals for the campus. This Campus is located in a serene environment with greenery on which the buildings of about 6729 sq. mtrs. constructed. In addition to the main building, this campus also has Boys’ Hostel (60 rooms), Girls' Hostel (24 rooms) and also 9 units of Staff Quarters.